I adapted this recipe from one I found on the Peta website while searching vegan passover recipes. In my version, walnuts add protein, Omega-3’s and give it great texture. Peel, process, mix, bake. Done! Preheat the oven to 375. Place the walnuts on a baking sheet and toast them for 5 to 7 minutes. Make sure you don’t forget about them; they can burn easily! When they are done, toss into the food processor and process until fine. Boil 1 cup of water and add it to the quinoa flakes. Let it sit for 3 to 4 minutes. Peel the sweet potatoes, the carrots, and the apples and place them in a food processor and process until fine. In a bowl, mix the sweet potatoes, carrots, apples, walnuts, raisins, matzo meal, quinoa flakes, brown sugar, and salt. Press into a baking dish (don’t make it too thick) and crumble a little brown sugar over the top. Bake at 375 for 45 minutes to an hour or until crisp on top and around the edges. 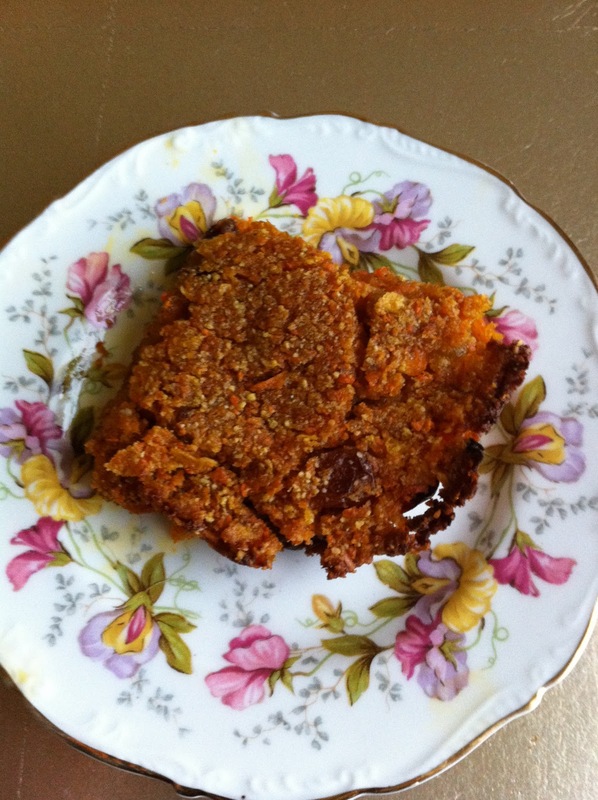 This kugel is sweet! Enjoy!